To end AMC's Dead, White and Blue weekend, a season five peek at "The Walking Dead" was provided and it looks like Carol and company are in dire straights. 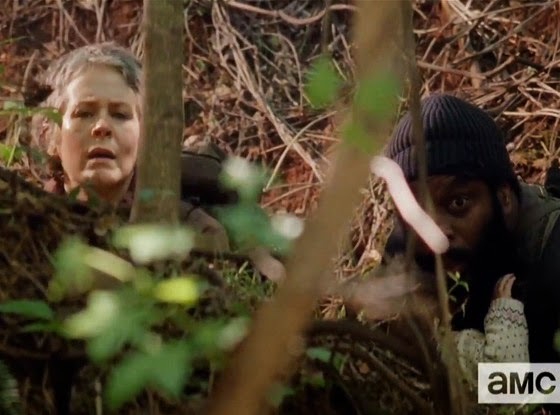 Carol, Tyreese and (bigger?) Baby Judith clearly haven't made it to Terminus but it looks like they have "more" problems. How about that rumor of Jon Hamm playing the villain, Negan (rumor thanks to Robert Kirkman deeming him perfect for the role)? Showrunner, Scott Gimple confirmed on "Talking Dead" that the character's show entrance would be "coming up eventually." Will Hamm be taking on the role? Regardless, his presence will prove to be quite interesting! The series returns this October.